Irish musician and songwriter Talos has unveiled a stunning visual accompaniment to his latest single This Is Us Colliding. 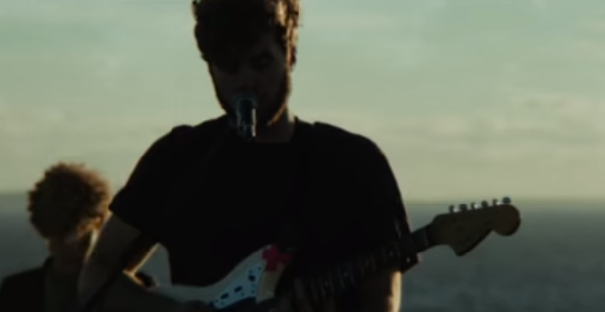 The video, shot on location in the Burren, was directed by the Corkman’s long time collaborator Brendan Canty of Feelgoodlost. The film centres around images of the musician and his band, performing the song atop a cliff, set against the remote and alluring landscapes of West Clare and the Wild Atlantic Way. Frames of Talos are cleverly interspersed with flashing acid drop colours and film-burn effects, and together with the beautifully edited and stylised footage of the coastline, they pick up on elements of the song’s central theme. The video is to breathtaking, as this song is to spine-tingling. There is something about Talos’ voice when it’s left to drift in isolation, across hushed minimalist instrumentation, that harks of times past. There’s an almost medieval quality to its quiet chant. It’s hard to balance those whispering tones with a powerful surge in delivery, but that is exactly what Talos does as he expertly sweeps the song from static beauty and ethereal spaciousness to majestic melodrama. Very few other contemporary artists can orchestrate emotion-piercing instrumentation quite like this. This Is Us Colliding due for release on 21st July, is lifted from Talos’ highly acclaimed debut album, Wild Alee, which you can buy or stream from the usual channels. Watch the spectacular video for this truly beautiful song here.